MONTVALE, N.J., April 3, 2019 /PRNewswire/ -- Sharp Imaging and Information Company of America (SIICA), a division of Sharp Electronics Corporation, today launched two new lines of its award-winning line of 4K Ultra-HD LCD (3,840 × 2,160-pixel resolution) commercial displays. Sharp's PN-HM Series includes the PN-HM651 65" Class (64 ½" diagonal), PN-HM751 75" Class (74 9/16" diagonal) and PN-HM851 85" Class (85 9/16" diagonal) displays. They each provide a brightness of 500 nits, are designed for 24/7 environments and are built to handle a range of signage needs, from simple set-ups to large networks with multiple displays. The new PN-HB Series includes the PN-HB651 65" Class (64 ½" diagonal), PN-HB751 75" Class (74 ­9/16" diagonal) and PN-HB851 85" Class (85 9/16" diagonal) displays. They each have a brightness of 350 nits, are designed for everyday 16/7 operation and are ideal for most well lit environments, providing outstanding versatility in commercial settings. 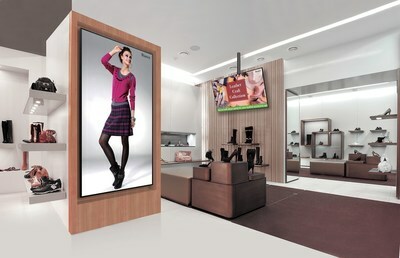 Both new lines deliver digital signage straight out of the box with a built-in system-on-a-chip (SoC) controller. The durable and highly flexible displays can support a wide range of signage needs. Whether installed in a shopping mall, transport hub, or conference hall, they provide powerful signage solutions that deliver content and messages with style and precision. "We are excited to introduce our newest generation of 4K Ultra-HD displays, which provide powerful new solutions to deliver commercial content," said Gary Bailer, Director of Product Planning & Marketing, Pro AV Products, Sharp Imaging and Information Company of America. "The PN-HB and PN-HM series provide organizations greater versatility and easy operability in a wide variety of settings, sizes and applications. With these new additions, our smart signage is now available in 10 models – from 40" to 85"Class sizes and a number of sizes in between – in different brightness levels." Both display lines come equipped with Sharp's integrated system-on-a-chip (SoC) controller driven by an Arm® Cortex® hexa-core processor. The displays support both H.264/AVC as well as H.265/HEVC. The latter is a next-generation, high-efficiency video codec that reduces the communication burden during video transmission and gives content a new level of depth and presence. This platform also allows third-party soft­ware developers to create custom signage applications, allowing for rich possibilities for digital signage in retail, office and other settings. Sharp has alliances with various developers through its Sharp Open Architecture Program, including Appspace, Enplug, Capital Networks, Industry Weapon, Navori, Novisign, Omnivex, Onsign TV, PingHD, Revel Digital and Starmont. Certification under the Google® Compatibility Test Suite (CTS) assures compatibility with third-party Android pps. Moreover, the displays feature a pre-installed HTML5 browser and support high-speed wireless LAN and features built-in Bluetooth® connectivity, allowing users to deliver content and connect equipment wirelessly. When the displays are powered on, a built-in media player automatically starts playing content stored in internal storage or on a USB memory device or microSD card. A simple schedule function allows users to pre-register seven patterns for when to start/stop the content playback. Users can also make playlists that combine still images and videos, all without any extra software, special skills, or even a PC. Sharp's Content Distributor software also makes it easy to update the content to be displayed on multiple LCD displays, schedule what content gets distributed, when it gets delivered, and which displays show it. The displays also come bundled with Sharp's e-Signage S software, which supports creating, scheduling, distributing and managing a wide range of signage programs on Sharp LCD displays, as well as creating editing signage programs through simple drag-and-drop operation. All of the new displays are equipped with a variety of inputs to support up to 4K60p playback. Designed with flexibility in mind, they can be installed in landscape or portrait orientation, or even face up. They can also be tilted – either backward up to 90 degrees or forward up to 20 degrees – providing more freedom to meet today's demanding signage needs. Up to four displays can be set up in a daisy chain configuration, allowing users to display the same content simultaneously on all screens. The PN-HM751 and PN-HB751 smart 4K Ultra-HD displays will begin shipping in April, while the PN-HM651, PN-HM851, PN-HB651 and PN-HB851 will ship later this spring 2019. Sharp Electronics Corporation is the U.S. subsidiary of Japan's Sharp Corporation. Sharp is a worldwide developer of one-of-a-kind home appliances, networked multifunctional office solutions, professional displays and energy systems. Sharp was honored as an inaugural Thomson Reuters Top 100 Global Technology Leader in 2018, recognized as one of the tech industry's most operationally sound and financially successful organizations. Sharp Imaging and information Company of America, a division of Sharp Electronics Corporation, markets Sharp's business products, including professional and commercial displays. Through U.S. Professional Display Distributor sales channels, Sharp is the top selling volume and revenue share brand of 60"+ Professional Flat Panel Displays. * Sharp's professional and commercial displays are specially engineered for business applications and are offered in a wide range of sizes and varying capabilities. From high-impact displays for digital signage, to state-of-the-art ultra-narrow bezel video walls, to the award-winning AQUOS BOARD® interactive display systems, Sharp commercial and professional displays help you communicate, collaborate and disseminate information brilliantly. For more information, visit our website at siica.sharpusa.com. *Results based on PMA Research, the large screen displays experts, U.S. Distributor Flat Panel Tracking Service report, January 2019. Results are not an endorsement of Sharp. Any reliance on these results is at the third party's own judgement and/or responsibility. Visit pmaresearch.com for more information. For more information on Sharp's business products, contact Sharp Electronics Corporation, 100 Paragon Drive, Montvale, N.J., 07645. For online product information, visit our website at siica.sharpusa.com. Become a fan of SIICA on Facebook, follow us on Twitter, LinkedIn and Instagram and watch us on YouTube.